I like sitting down at the desk and working with Charlotte and Matt in the service desk. It's more personable that way and they are able to look up my history on their computer and tell me if I have any special deals coming to me. They are both pleasant to work with and they are the reasons why I keep coming back to Joe Rizza Acura to have my service instead of the dealer where I bought my car from. I hate going thru the express. I hate having to stand outside of my car and explaining what I need to have done to my car and signing papers. It's not personable and I found myself juggling my purse and other items I had with me to sign the papers they handed me to sign in order to have my car service. Had a 2008 TL for 10 years and 271k miles, then hit a deer. Read all the reviews and found the Acura TL 2012 SH-AWD to be the perfect replacement vehicle. It is just the right size for high mileage driving!! Not the best gas mileage for around town driving but wonderful for the interstates. Expect the odometer to reach 300k or more! Mike R was amazing. He even traveled to Chicago to bring our car to a different locations so we could see it. I would highly recommend this location. Fun & reliable daily driver! This car fulfilled all my needs for a daily driver! Commuting, vacation,golf, etc... Would recommend to anyone. Enough room if your tall or small. Kids had plenty of room in the back seats as well. Hold good value & easy to maintain! Frank was a friendly, approachable and knowledgeable guy with a sense of humor. We spent the entire day with him, and ended up with a great car. Going through the Costco program helped get our price down from the start. SHO model well worth it. Still adding music too hard drive. TLX did not match quality,size off style. Paint excellent. Wheel package paid for itself. I love everything about this car. The roomy interior is very comfortable. It is stylish and reliable. It has plenty of power and smooth ride. This car has been the most reliable transportation I've ever had and gets great gas mileage. It's never let me down it's always got me from point a to point b. Loved our experience. And we saved over $2500! Loved our experience! And we saved over $2500 from dealer price for exact same Honda. Except Silver Auto Honda had 12000 fewer miles. Salesman awesome. This car was a great daily driver. I drive a lot and was comfortable and safe the entire time. Myself, and passengers, were always comfortable on long road trips. This also had amazing technology features, and was an overall fun car to drive! I got my 2011 335i from Chicagocarsus a couple of weeks ago, now I want to share some experience that I had in this store. First, they have one of the best inventory in town, if you are a europe performance car fan, and you are looking for something affordable and exotic, you have to go there and check what they have. Second, Jacob, the manager there, he is a really nice person, and he know cars very much. I traded in my car from him, and doing bussiness with him is just making things much easier. Last, if you folks looking for a E46 M3, you can go there check my previous car, it is still in a very good shape. I trade in for 335i is only because of moving, the small town I moved to just do not have so much track fun like big city have. I have enjoyed owning this car. It gives you the best of both worlds. Luxury and sports car all in one package. I wish the seats were real leather. I am experiencing some peeling. I also hate Acura stop making this style ( TL) , I’m not a fan of the TLX. However, it’s a great midsized car to own. I would like to thank Patrick, Geoff, and the entire McGrath team for helping my wife and I with the purchase of our 2018 TLX CPO. Our salesman Patrick was patient, knowledgeable and helped us through every step of the process. I would recommend him and the entire team to anyone and everyone. Thanks again! I can't tell you how well these cars hold up. I sold my previous Acura with 207,000 miles on it when this car showed up on the dealers lot with 107,000 miles. Now at 200,000 and running great. Body looks good. Great place to buy a car, was in the market for a used car. My salesman Patrick O’Day Is a really understanding and great salesman. Dealt with both him and Ulises Garcia Used car manager there. Both were really understanding of what I was looking for , great people to deal with, Will buy from there again! 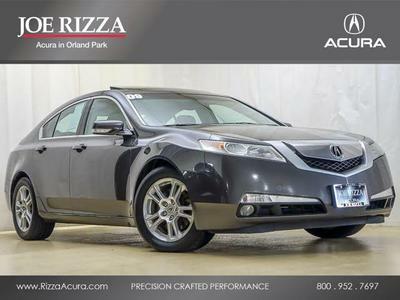 I have the advanced package and this car is a great intro to the Acura brand, even being a used car. The seats are comfortable, so no matter how bipolar Texas weather can be, I can heat or cool my seats. Great leg room in the front and back, and the backseat is great for passengers. I actually really enjoy the back when someone else is driving. ALSO, the Dolby Pro-Logic sound system is AMAZING! Great mileage, even though you need to buy supreme gas, but I only fill up about once a week/week and a half. It’s a huge upgrade from my last car, and I’m definirely considering an Acura for my next car. I plan to keep this as long as possible. The car matches the title (in that order). Extremely reliable in every sense of the word. At the end of the day it's a Honda. The 3.5L V-6 has been around forever, and for a reason. It just goes and goes. The interior is classy and understated. The interior has quality materials that are made to last. There is leather, wood, or aluminum everywhere. Creature comforts like climate control, bluetooth, and seat warmers are available. For a four door sedan, it is relatively fun to drive. Neutral to understeer is the tendency, so in a way it evokes confidence. The engine has VTEC which helps increase the fun in the higher end of the rev range. Sport mode and paddle shifters also help make this feel sporty. Ultimately, it's comfortable and reliable way to get around without breaking the bank. The performance of this car was beyond belief. The cars was very comfortable and the performance was exceptional. The exterior design is state of the art. When you see one on the road, it doesn't look as old as it is. This is my first luxury brand car and it is leap and bounds above the other cars I have had. The seats are comfortable, good acceleration and power, large trunk and back seat. The only issues I have had are weatherstripping on the windshield falling off, the leather on the side of the drivers seat starting to wear and the plastic behind the door handle falling off. I do wish it had back up sensors or a camera. Felt welcome as I entered the door. Staff was available and when I asked for the sales person that I had been communicating with, salesperson was waiting. Bought new in 2010 drove 50k on it and traded for a Lexus. Excellent car but rough ride and road noise. Nice feature with tech package was nav and hard drive recorder for all your cds. Wanted something smoother and quieter so went Lexus. If you like sport ride you will like it. Never had a single problem with the car. Car shopping is not fun, but it&apos;s a lot better when the experience is made better by kind salesmen. My car was totaled several weeks ago and I was getting increasingly annoyed about how hard it was to find a new (to me) car. After calling multiple dealerships and not getting calls or emails back, setting up test drives and arriving from 50 miles away to find that cars aren&apos;t actually available or not pulled up like they said, I finally found Chris at Cars R Us. I called from about 30 minutes out and said I was interested in the 2015 Chevy Sonic posted online and he immediately said he&apos;d have it pulled out for us to test. For once, this was actually true when someone said it! It was a good start, especially considering their lot is small and crowded and it would have been annoying if we had to wait for it to be pulled out. The test drive went great, he was extremely informative and genuinely easy to interact with (not always easy to say about salesmen). When we did an inspection of the vehicle we found that it was missing a spare tire, which he offered to have one put in without me even having to ask. I was really interested in purchasing the car, but found that the touch screen radio was having issues and actually had been recalled for that specific vehicle. He personally took it to the dealership to have it replaced before we officially purchased. While the process was a little slow from start to finish considering I didn&apos;t have a vehicle in the meantime (two weeks total, one week waiting on this car) it was totally okay since Chris was such a pleasant person to work with. He answered all of my questions, listened to my concerns, and even wrote on the paperwork that if I drove the car home and found something I didn&apos;t like he wouldn&apos;t push the final sale through. I found him to be very honest and really appreciate the attention he gave to my situation. Thanks Chris, and thanks Cars R Us. Great employees really do make a difference. This car is very good and in excellent condition, I am using it for my Work / Family purpose. This car is well maintained / regular service.There are no accidents and major repairs for this vehicle. I bought a 2009 Tribeca from the dealership. The price was very fair, I didn&apos;t have to haggle at all. There were some issues with the interior of the car and they fixed everything before I came to pick up the car. The buying process was very simple. All the employees were very friendly and made things very easy. I worked with Mitch and he was great! He checked on me the day before I came to pick up the car to see if I needed a ride from the train station, then called a week later to make sure the car was doing well for me. I would definitely recommend this dealership. I bought a great car from Auto House Motors in Downers Grove. I worked with Martin. He was very informative and helpful. I would definitely buy another car from him! Comfortable, good on gas and FAST. Wish I could have got one with AWD. I love the performance and color. THIS CAR HAS IT ALL. Reliable Luxury Car for what you pay for..
An exquite car with both luxury and performance all in one. Solid handling and aggressive horsepower at 258 HP. The car overall is reliable and is a good bang for your buck car. I have been pleased with the amenities of the interior luxury this car has to offer. The most comfortable and reliable car I’ve ever owned. It has great pick up and drives really smooth. I would definitely recommend it to someone looking for a safe sedan. Sporty and Luxury at the sane time..great features and amenities, very smooth ride with plenty of power to boot. plenty of leg room, beautiful leather interior. Love it!